The U.S. Mint 2008-W American Buffalo Gold Proof one-quarter ounce coin sold out on Wednesday. The bullion coin joins a moving fleet of other sellouts, including the final American Eagle Platinum Uncirculated coins earlier Wednesday, and the sold out Gold Uncirculated American Buffalo 4-Coin Set on Monday. None of the above coins will be minted in 2009. The Mint said nearly a month ago that it would trim its portfolio to better focus on core products, and these coins were on the "last chance" list. Mint sales figures released last week show 4,105 of the individual 1/4 Buffalo gold proof coins had been sold, as well as another 5,796 that were included in the 4-coin proof set. The CoinNews collector tool page U.S. Mint Collector Bullion Coin Prices, Premiums and Sales Figures has been updated, making it easy to spot already sold out coins and sales figures for those still available. 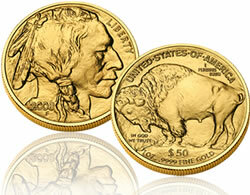 The Mint page for its series of Buffalo coins is located at: American Buffalo 24K Gold Coins. I bought 20 of these in 2008. How much are they worth now?